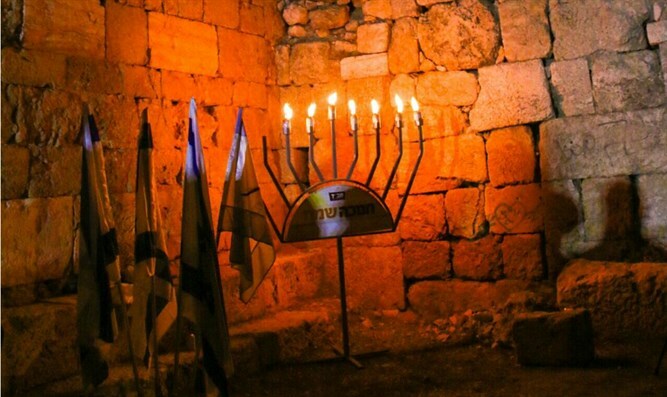 Har Hevron residents light Hanukkah candles in ancient Eshtemoa synagogue, located in an Arab town. 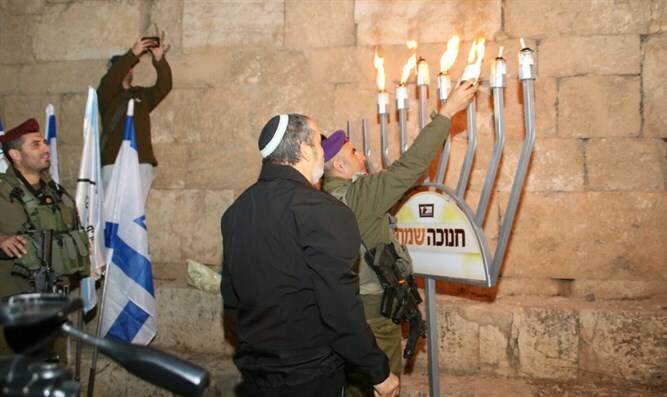 IDF soldiers from the Judea Regional Brigade and Har Hevron residents on Sunday night lit Hanukkah candles in an ancient synagogue in the Arab town of as-Samu. Mount Hevron Regional Council Head Yochai Demeri said, "We thank the soldiers and commanders of the Judea Brigade, who work day and night to ensure our daily security. Visiting this special site during this period is not something to be taken for granted. Only commanders who understand that our strength comes from our roots would encourage civilians to visit these important sites." "The Hanukkah story gives us strength to settle the land: A small handful of Jews were willing to fight a world power, out of faith, without calculating whether it is worth it. This is the way we need to handle settlements. We have had the right to return and settle here, for fifty years. But our work is not yet finished, and we face several challenges. We will work with the same determination and devotion that the Maccabees had, and there is no doubt we will succeed and be victorious." "We will not give up any part of our land, and we will not give up this synagogue or any others. Eternity is with us, and one day we will return to this place." Judea Regional Brigade Commander Itzik Cohen said, "We are excited to enter this place, and it was very important for us to allow entry to this special site. The Hanukkah holiday symbolizes strength. I wish all of us the ability to continue living quality lives here. Our job and our hope is that there will be peace and quiet here, and we all pray that we will be able to see the area thrive and be secure." "During my time in the Judea Brigade, I saw settlement activities in all areas, but especially in the educational activities of Har Hevron and Kiryat Arba. I really admire it." The al-Samu synagogue, also known by its Biblical name of "Eshtemoa," dates back to just after the Second Temple Period, when large Jewish communities left Jerusalem after the destruction of the Temple to settle in Har Hevron. The remnants of four synagogues have been found in Eshtemoa, Susya, Maon, and Anim, clearly proving a Jewish presence in the area. Eshtemoa itself is mentioned several times in the Bible, and is described as being part of the Tribe of Judah's territory. The site is also mentioned in the Jerusalem Talmud, as well as by a Christian historian. All of the sources note the large Jewish settlement which existed in the area. Dr. Doron Sar Avi, a Susya resident and the Director of the Land of Israel Studies Department at Herzog College, told those gathered on Sunday that most of the menorahs at the Israel Museum come from Har Hevron. According to him, the local Jews chose the menorah as their symbol, engraving it in the doorways of synagogues and homes.